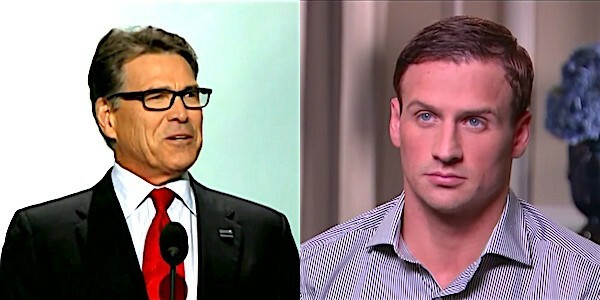 The Season 23 cast of Dancing with the Stars has been announced and includes disgraced Olympic swimmer Ryan Lochte and the homophobic former Texas Governor and failed presidential candidate Rick Perry. Also, model and actress Amber Rose and ’90s rapper Vanilla Ice. Pairings are Vanilla Ice and Witney Carson, Calvin Johnson and Lindsay Arnold, Ryan Lochte and Cheryl Burke, Amber Rose and Maksim Chmerkovskiy, Rick Perry and Emma Slater, James Hinchcliffe and Sharna Burgess, Kenneth “Babyface” Edmonds and Allison Holker, Jake T. Austin and Jenna Johnson, Maureen McCormick and Artem Chigvintsev, Marilu Henner and Derek Hough, Terra Jole and Sasha Farber, Laurie Hernandez and Val Chmerkovskiy, Jana Kramer and Gleb Savchenko.